Edited by Hillsdale College History Faculty - Paperback, 882 pages. This reader is mandatory, being used in one of the core required classes to educate Hillsdale College students in a liberal arts education. 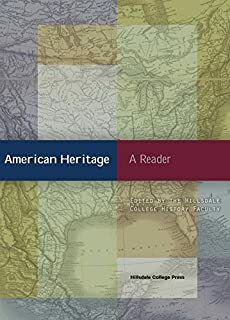 Table of contents: I-The Colonial Heritage / II-Awakenings and Enlightenments / III-The American Founding / IV-Democratization and Expansion / V-Sectionalism and Civil War / VI-The Gilded Age / VII - America Between the Wars / VIII-America Since World War II. The $4.99 S & H fee will not appear on your confirmation, but will be adjusted at the time your order is processed!